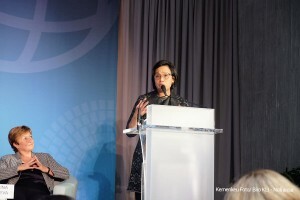 Through the blended finance scheme, she said, funds from the Government, public, private funds and even philanthropies are incorporated into SDGs Indonesia One, a platform for infrastructure development financing with an orientation to support the sustainable development goal (SDGs) agenda, a collection of 17 global goals set by the United Nations to eradicate poverty. “It takes around USD6 trillion to implement SDGs agenda. We need to mobilize funds from the Government, public funds, private funds and even philanthropic funds but also a blended finance scheme initiative. This initiative comes from Ministry of Finance through the Special Mission Vehicle (SMV),” she said. For the record, SDGs Indonesia One has collected funds of USD2.46 billion since it was established at the IMF-WBG Annual Meetings in Bali last year. The funds collected were derived from Government institutions, development banks, commercial banks, climate change funds, equity investors, insurance companies, and local and international philanthropists. The Indonesian Government, Sri Mulyani added, has also issued sukuk (Islamic bonds) as one of the Islamic financing instruments. She cited the example of the Global Sukuk Wakalah or state sharia securities (SBSN). It is the first Green Sukuk used for financing environmentally friendly projects in Indonesia and Asia. The issuance of Green Sukuk, she added, is one of Indonesia’s commitments for SDGs related to climate change or environmental issues such as renewable energy, sustainable transportation, waste management, and green buildings.